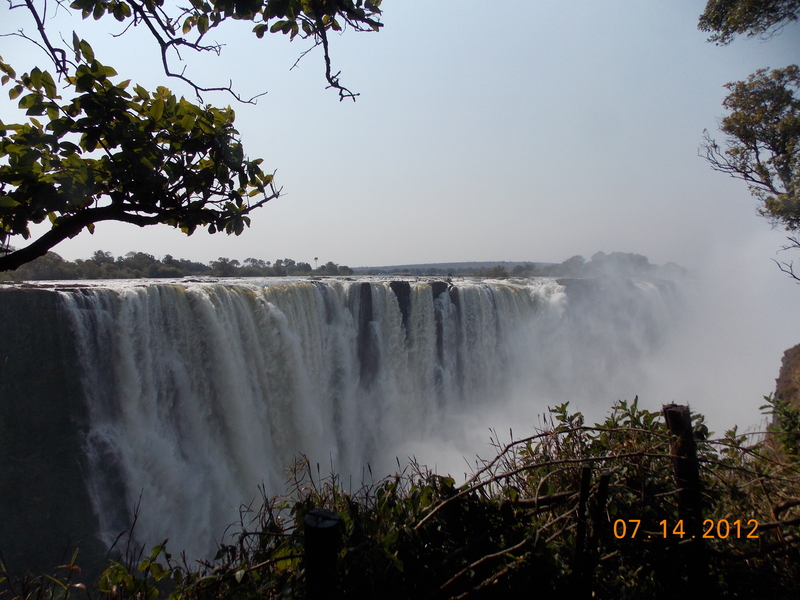 After two days in Zimbabwe, at Victoria Falls, I was very grateful that I had taken some last-minute advice and added it to the itinerary. The Falls themselves are worthy of all the superlatives, and the total experience was just a lot of fun. My hotel had a casino attached to it, always a good sign. 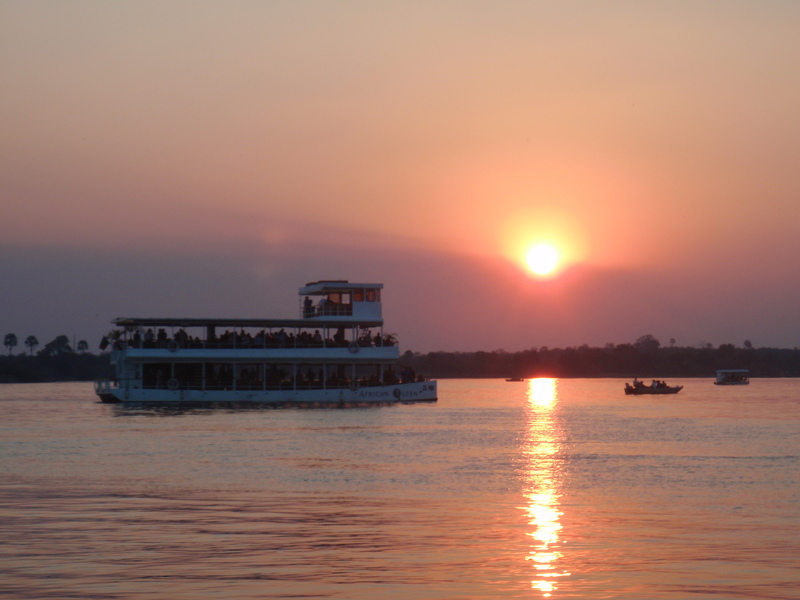 It was also much warmer here then in South Africa so had a beer at the poolside bar, enjoyed the sun and then headed for a sunset cruise on the Zambezi River. On the bus over I met a couple from Ottawa, Ted and Dorothy Gordon, and we had a wonderful, relaxing time on the cruise checking out the scenery and discussing the political differences in our countries. I was expecting we’d get close to the Falls on this cruise but it was more about the wildlife; we saw some very large crocs and a number of hippos. That evening I played a little blackjack and met a guy vacationing from Australia, Tim Blakeley. We had a good time at the table and made plans to do a steam train ride to the Falls the next evening. Connecting with the Gordons and Tim just reinforced that the best part of this trip is meeting other travelers and sharing experiences. It was a really good day. The next morning I walked the mile or so to the Falls, foolishly rented a raincoat for $5 (the currency in Zimbabwe is the American dollar!) and then walked the paths to the various overlook points. It was magnificent, although the further you go the less you can see because the mist created by the Falls is so thick. There is a statue of David Livingstone, the British explorer and missionary who was the first European to see Victoria Falls in 1856, and it’s fun to think about him hacking his way through the jungle, hearing it first, maybe seeing some mist through the trees, and finally breaking through to this amazing sight. I’m sure he was a Scottish gentleman and didn’t say what I would have said, but I’d love to hear the recording of whatever it was. The natives called it Mosi-oa-tunya … The Smoke that Thunders. Livingstone renamed it after his Queen. He was a bit wacky and went quite mad apparently, but he was relentless in his search for the source of the Nile and in conveying his anti-slavery message. He spent quite a bit of time on the east coast of Africa, where I am headed tomorrow and where slavery was rampant in those days. He was very sick with malaria his final years, after being found by Mr. H. Stanley, who I believe was a newspaper reporter sent to try and find him. 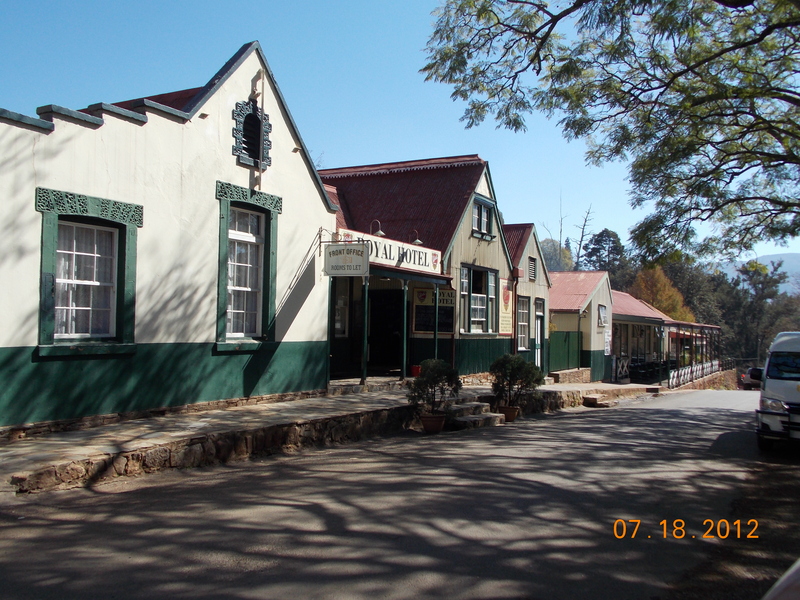 There is a drink they serve in the bar at the historic Victoria Falls Hotel called the “I Presume”. Or, if you happen to work for Apple, the iPresume. The train ride that evening was touristy, but fun. The steam engine was made in England in 1952 but some of the cars date back over 100 years, and the staff in their white uniforms and pith helmets give it a nice authentic feel. You don’t have to go far to get to the bridge over the river, which affords some beautiful shots of the Falls in one direction and a lovely gorge in the other. 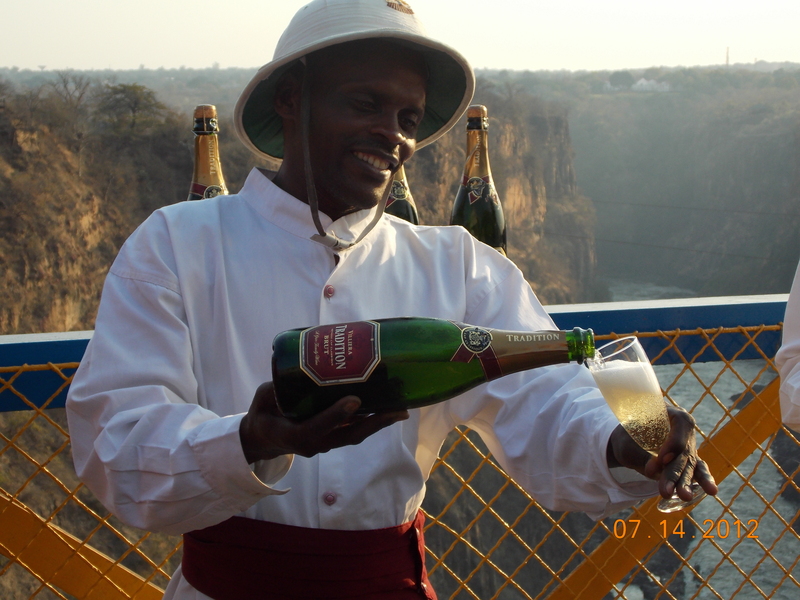 After actually crossing the border into Zambia you get off the train at the far end of the bridge and walk around for 45 minutes with a glass of champagne, fending off the vendors and watching the bungee jumpers, waiting for the sun to set. On the slow ride back I was hanging out the window at dusk thinking, man, this place looks just like the Africa I’ve seen in movies. Right on cue, in the trees about 50 yards away, two elephants wandered into view. Two days later I was in a van with five people from Germany and a guide, Fritz, who spoke German and did a great job balancing languages; thanks for the effort, Fritz. 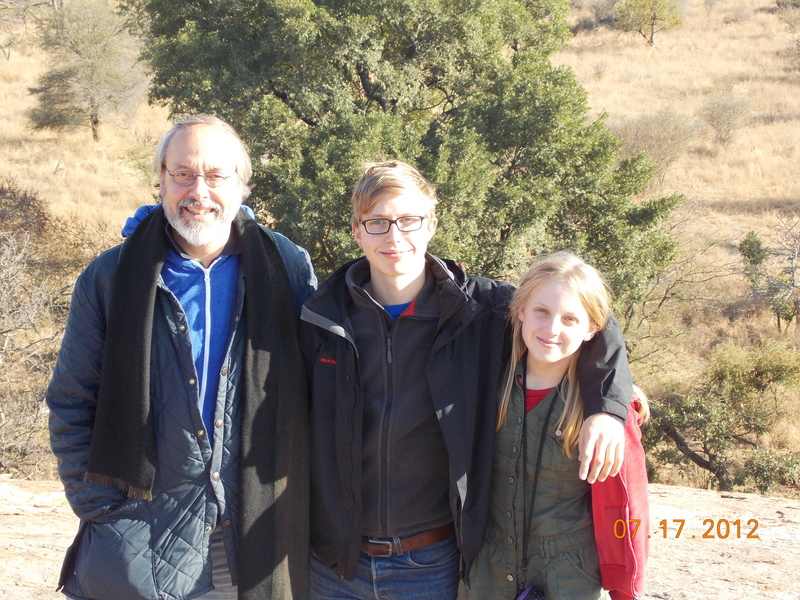 We were on the way to Kruger National Park in northeast South Africa, named after a former South African president Paul Kruger, who lobbied to make this a protected area because the large animals were being killed in unfortunate numbers. The park is 250 miles long and averages 35 wide, but it is soon to get much bigger as it expands officially into Mozambique to the east and Zimbabwe to the north. It took about five hours to get to the entrance so we had a couple of hours in the park before checking into the hotel. We saw a couple of elephants and giraffes, many different kind of antelope, some hippos lying in the sun. I’d seen quite a bit of wildlife by then, but I got a big kick out of the reaction of the others in the van. At dinner that night I got to know a family of three from Greifswald, near the Baltic Sea in northeast Germany: father Michael North and his son Chris, 16, and daughter Connie, 13 (I think). Michael is a history professor at the University of Greifswald, and is just this wonderful, interesting man who has traveled and lectured and taught extensively, including a year in Santa Barbara, California. He knows academic people all over the world, so not only am I hoping to drive up and see him and his family in northern Germany when I am in Europe, but because of Michael I’ll have contacts in India, Vietnam and other places I intend to visit. And Chris and Connie are terrific kids; he is a serous soccer player and wants to get a scholarship to play collegiately in the U.S., so maybe I can help spread around his recruiting DVD. When you travel it’s just amazing who you meet, how your interests intersect, how quickly you can develop a rapport. 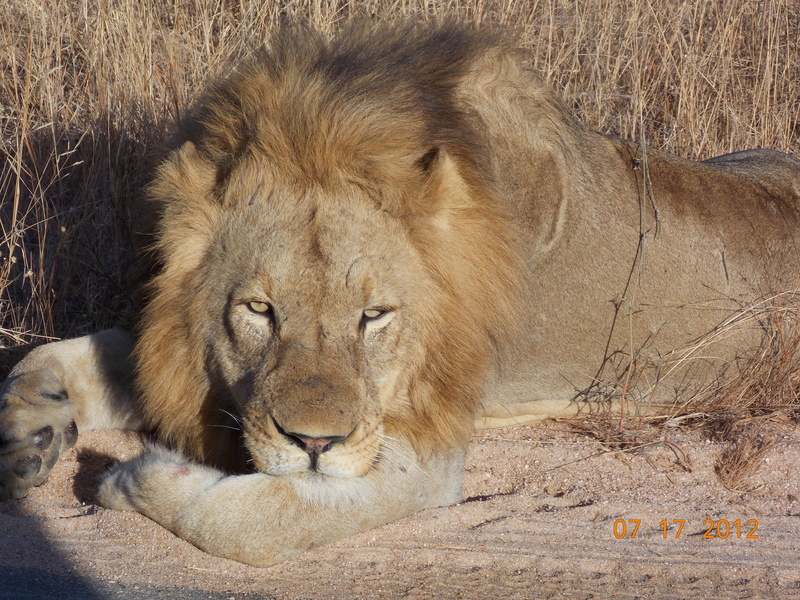 We spent the next full day in Kruger, and the highlight was coming across three young male lions, just lying in the street. 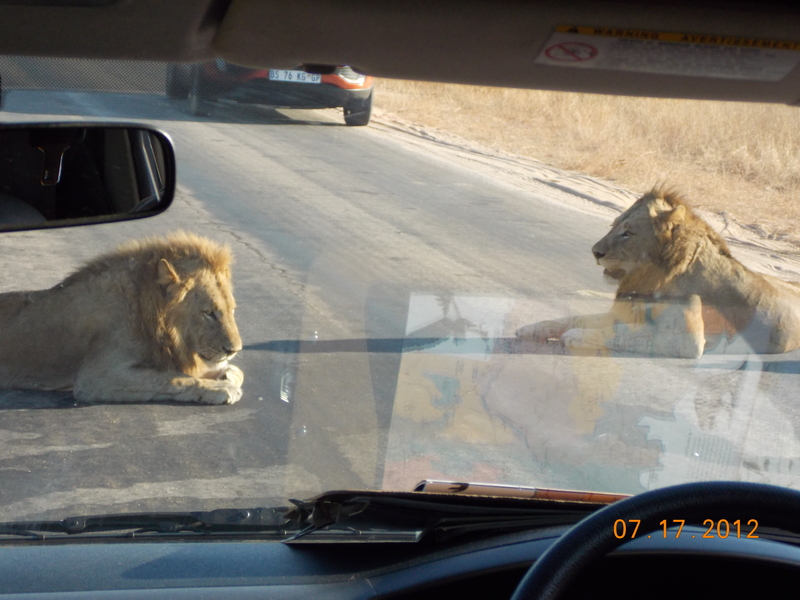 In Tanzania I’d seen lions up close, but all females. Of course an armada of vehicles was there as soon as word spread, jockeying for position, but we got a great look and some good pictures. The other two who drove uo with us – Katya and Anka, dental assistants from Rendsburg, also in the north of Germany — had taken another vehicle and had seen leopards and cheetahs as well, and they were very animated and excited that night at dinner. In German, of course, but I got the gist. The drive back to Jo’burg was much different than the drive up, more scenic, through lots of forest and farmlands, rolling hills and mountains. My favorite stop was an old mining town called Pilgrim’s Rest, which developed after gold was discovered there in 1872 by a guy called Wheelbarrow Petterson. Ol’ Wheelbarrow had ditched his donkey after getting kicked and just wheeled his way from Cape Town to these mountains north of Jo’burg, maybe 2500 miles (a very loose guess), and he decided that was where this pilgrim was going to rest. The story and the town remind you of old mining towns and tales in the U.S.
Back in Johannesburg, it was appropriate that on the day after Nelson Mandela’s 94th birthday I see several places where he lived and worked, visit Soweto, tour the Apartheid Museum and see other sites in the Johannesburg area related to the country’s history. Soweto (SOuth WEst TOwnship) is enormous, sprawling. I was told while in Cape Town that it had 2.5 million residents, but my guide today, Klaus, said it was closer to 5 million. Either way, more people live there than in Johannesburg, which is primarily a business district. There are many very nice neighborhoods in Soweto, and there is a lot of commerce. There are also “squatter camps” along the lines of what I saw in the Cape Town townships, but neither as extensive nor as congested. 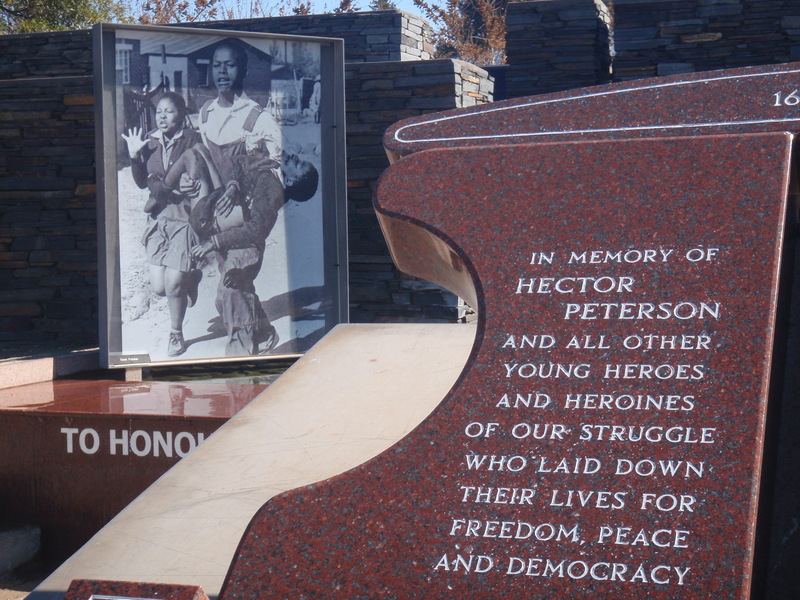 On that fateful day in 1976 a shy young student named Hector Pieterson was the first killed, by a stray bullet, and he is now a symbol of the uprising with a museum dedicated to him and others who died. Outside there is a chilling photograph of Hector in the arms of a man who became a reluctant hero, and Hector’s hysterical sister. The schools were ultimately closed until January, 1977, and there were one million students unaccounted for who had been in school the previous January. No one seems sure where they went. The violence went on for years, with thousands killed, but ultimately it was violence that focused the world’s attention and turned the tide against Apartheid. We visited the Regina Mundi Church, where bullet holes remain in the ceiling and in old plastic windows that have been saved. The church has a photographic exhibit of the Soweto uprising that is very powerful and disturbing. 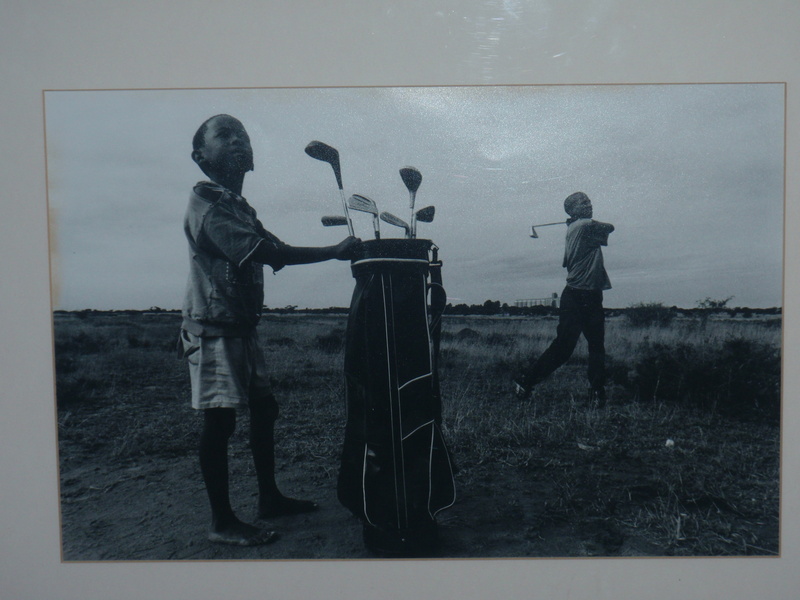 Among the photos I found an extraordinary picture of two young black kids playing golf in 1998 – ironically just months after the formation of The First Tee was announced. The street on which Hector died is Vilakazi Street, which Klaus called “the most famous street in the world” because it was the home of two future winners of the Nobel Peace Prize: Nelson Mandela and Desmond Tutu. Mandela’s house was 25 yards away from the family restaurant, which still exists. On the way back to Johannesburg Klaus took me to the Apartheid Museum. Your admission ticket randomly identifies you as either European or non-European, and each has different entrances and different opening experiences. You are immediately bombarded by pictures of signs in English and Afrikaans: “black men only”, “European women only”, etc. The highlight, for me, was the various video clips. To see Stephen Biko on tape was stirring, as he balanced his messages of black pride and pacifism. Biko was jailed, beaten and (it is assumed) starved, and he died incarcerated at age 28. At the same time, to watch tape of white officials justifying Apartheid to purely white audiences was nauseating. It’s a great museum, emotional and imaginatively configured, and it was a fitting conclusion to my South African education. I leave tomorrow morning for a five-week volunteer stint in Bagamoyo, Tanzania. I don’t know how often I’ll be posting on the blog during that period, given the necessary restrictions placed on the volunteers for reporting and photos, and since I’m not sure about internet availability. But if there are interesting stories I can share I will do so, technology permitting. Thanks Ruffin, for another great insight into your wonderful travels…I feel like I am on a educational tour of Africa with a great teacher pointing out the important things to take note of. Looking forward to your next adventure in Tanzania…I know it will be equally educational for those of us that are following your travels…. Sounds like you are having a great adventure so far! Love reading your blog and seeing the pics!! Everyone at the Lodge says “hi”….we miss you! !